A treasure revealed–if you could see inside that opening, you’d find a largish, box-shaped area with cool water pooled in the bottom. Perfect for keeping milk and eggs fresh. A crew has been cutting trees and clearing brush under the power lines along our road. It’s mostly something of an eyesore (though I understand the need), but last week they uncovered something really wonderful. A spring house. While the road I live on has become more and more residential in recent years, it used to be the country proper. There are some time-worn barns, farmhouses, pastures, even an old hay rake rusting under some apple trees. Markers of the past. I love seeing signs of the way things used to be so I was absolutely delighted when we were walking Thistle last week and saw–just off the paved road–a stone wall over a concrete box with water running through it. Someone put a great deal of time and effort into building such a fancy spring house and I wished I could put some glass bottles of milk in there to cool. Of course, this is a relatively small spring house. Often it would be a small outbuilding constructed over a spring or in a spot where a creek could run through it if a spring wasn’t handy. It was certainly the coolest place on the farm come August. There used to be an even smaller spring house on the farm in West Virginia. It was still there when I was a kid, but has succumbed to time and the elements. 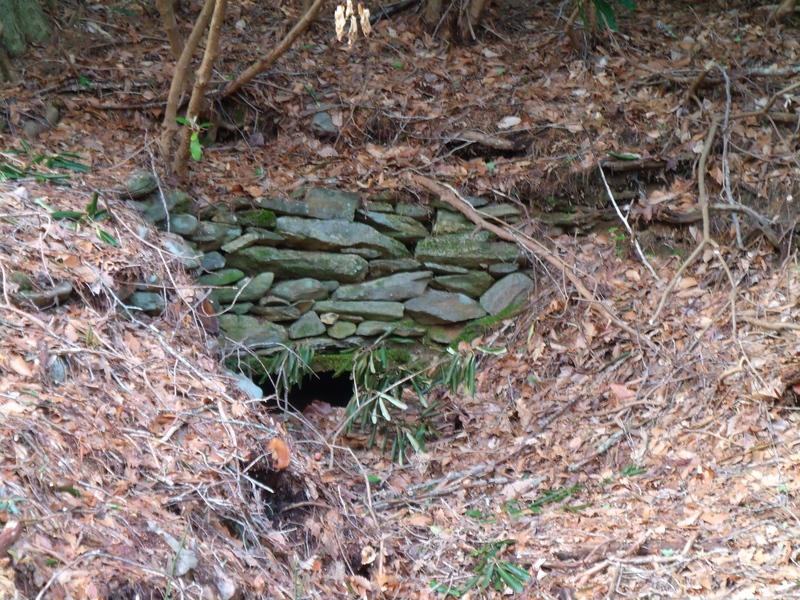 Peering inside that magically revealed spring house on our walk, I could just imagine all the food stuff stored there over the years. I wish someone could tell me who built it and who used it. When did they get a refrigerator and let the brush and bramble take it over? But, hey, I’m a writer. Even if I never find out the real story I can surely write my own. Ohhhh…that explains it! Okay, this is where I admit pure ignorance. I never knew a spring house was built over a spring! I thought it was something only used IN Spring. Duh! And yes, the government allows me to drive a vehicle AND live un-assisted. Thank you for this, it was a laugh out loud moment, in a very sweet post. Oh my–so glad I could clear that up for you!